When we traveled to Antarctica in 2008, our guide had waxed eloquent about how much he hoped someday to visit Tristan da Cunha, the most remote human habitation on the planet. We had never heard of it, but Jim never forgot his comments. A year or so later Elderhostel advertised a cruise across the South Atlantic that included a stop at Tristan. Jim was sold. 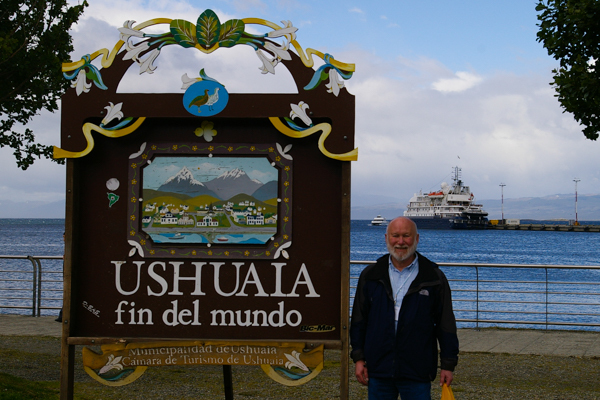 Mary Ellena was captivated by the chance to revisit Tierra del Fuego and the Falklands. So we signed up. It was the trip of a lifetime in more ways than one! 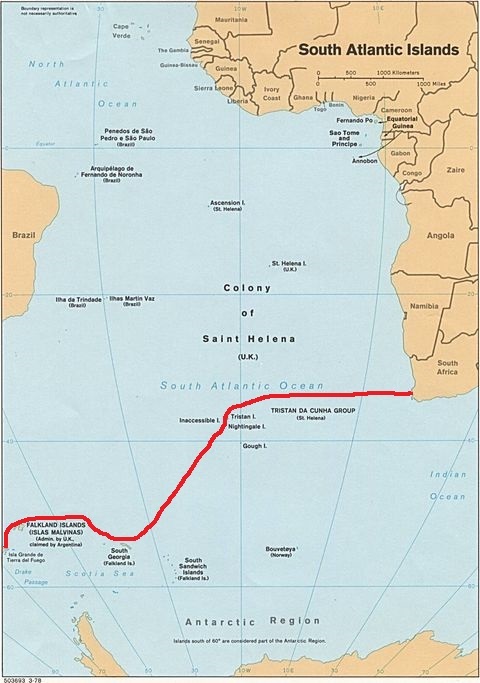 The map shows our cruise route across the South Atlantic. We started in Ushuaia at the tip of South America, spent a couple of days visiting the Falkland Islands, sailed to South Georgia, then to Tristan, and ended up in Cape Town, South Africa. The source for this map is the CIA. See the narrative below for details on our trip. I've tried to make the narrative a complete summary, but I've used many links to other web sites to provide additional details and sometimes pictures. You can either stick with the basic narrative or explore the various links. I've reviewed the links in the winter of 2019, and at that time they were all valid, but the WWW is in constant flux and that can change. If you encounter broken links, please send us some email. Much of the trip was cruising in the open ocean. Click to see some of things that kept us occupied while at sea. 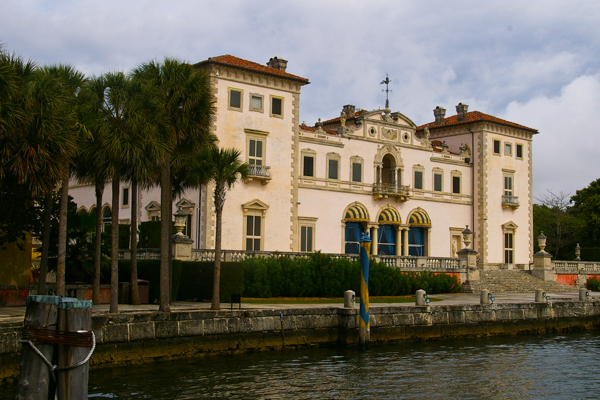 Not wanting to risk missing our plane to Buenos Aires, we went down to Miami a day ahead and spent the time at Vizcaya - a marvelous house museum of the early 20th century. That evening we met most of our group at the airport for the flight to Argentina. 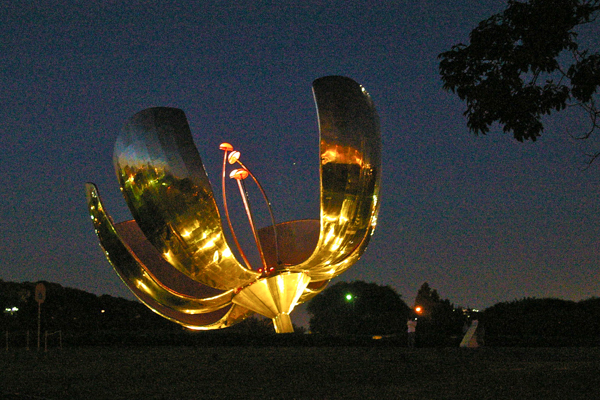 When in Buenos Aires in 2008 we had been charmed by the huge sculpture of a flower called Floralis Generica. Since it was within walking distance of our hotel, we wandered down to see it lighted at night. Lovely! The mechanism that once closed the petals at night was no longer working, but it is still beautiful. Many locals strolled by and there were others across the boulevard playing soccer. Down the street young people were gathered outside the art museum. It was the only ship in the harbor this late in the austral summer, and we were soon to leave on the "repositioning cruise" across the Atlantic for the ship's summer season in the Mediterranean. 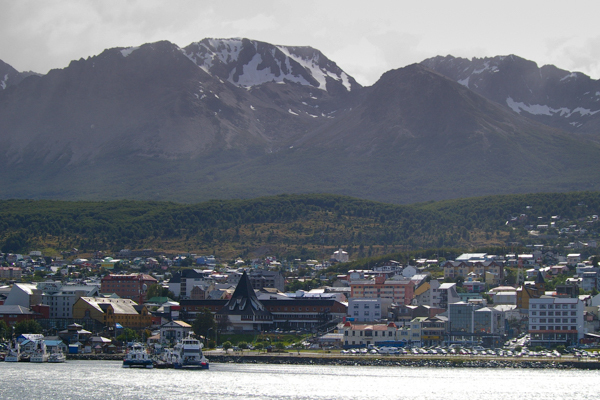 When we visited Ushuaia in December, 2008, the pier was crowded with passenger and cargo ships. That evening we boarded the ship that would be our home for the next three weeks and bade goodbye to Ushuaia. I still want to return and spend more time on this island with its rugged beauty. We cruised down the Beagle Channel towards the South Atlantic and our ultimate destination of South Africa. The Corinthian II was a delightful small ship with an outstanding crew and staff. Although the ship holds up to 114 guests, we were only around 40 passengers. The ship was fully staffed and you may be sure that we were waited on hand and foot! In addition to our Elderhostel / Exploritas / Road Scholar group, there were a number of others who either booked their cruises directly with Travel Dynamics or who were traveling with other affiliations. There were two individuals who were "penguin collectors." They had a goal of photographing all of the penguin species. On this trip they hoped to see the Northern Rockhopper, which primarily breeds in the Tristan island group.